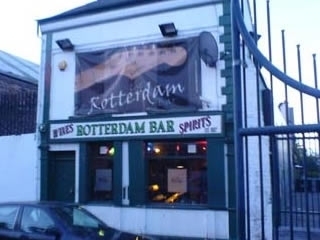 The Rotterdam has been saved from demolition and now has live music seven days a week. The Rotterdam Bar was used as a hold for prisoners prior to deportation to Australia, and despite a few more recent fires, has stuck to its old world feel. Small and very cosy, with heavy wooden doors, whitewashed walls and oceanic paraphernalia hanging from the walls, it's intimate and interesting. This bar offers a wide variety of quality entertainment seven days a week. The bar is now run by the original owner of fifteen years ago, Chris Rodddy and maintains the spirit of Sailortown. Your guaranteed a warm welcome and there is always a real coal fire lit, even during the summer to give you that home from home feeling. 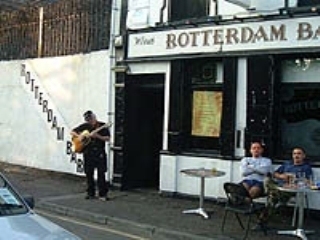 The Rotterdam is situated on Pilot Street at Clarendon Dock, and you can sit outside on summer evenings and enjoy the atmosphere of this old area of the city known as Sailortown. Enjoy one of the best pints of Guinness in town, with a warm fire,live music and great craic, a must for any visitor to the city, see ya there. Have you got Google Earth on your computer? If so, then download the Google Earth view of Rotterdam Bar. Is this the wrong position for Rotterdam Bar? If you think so, then modify its position. Click / Tap the button above to get directions from where you are to Rotterdam Bar. I remember watching local Bréag group playing at the Rotterdam pub back in 1998. I liked the place (and the group, which I knew from other concerts). I am confused, Rotterdam is now closed or still in operation? I used to frequent ti very often when living in Belfast a few years ago and had some great nights. I am foreigner and on first couple of visits bar tennders were not extremely friendly, -there seem to be a "certain intimidate circle of friends" frequenting the place- but after my third or fourth visit, I was becoming "member of the club" and always got a warm welcome. A very cosy place, and clientelle were quite a characters... I so much miss this place. I plan a trip in Belfast latter in the year and it is definately on my list if it is still up and running! good place, good serving and very good music, most of the time. Another great Belfast landmark gone. Every redeveloped dockland area is an investors wasteland a ghost town after the sun goes down. Penthouses and underground car parks with security codes and nightwatchmen. 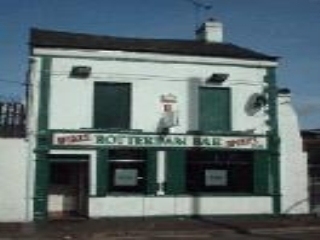 You would have thought that the 'new belfast' would have valued having a great little boozer on their doorstep. Sorry to hear it's closed. Back in the 1990s it was the best bar in Belfast. Unfortunately closed now :( If you haven't been here, you've missed out on a unique belfast pub! Was a great venue for all types of music from around the world! cant wait to go there again! WILL ALWAYS REMEMBER COLIN WHO RAN THE QUIZ . The rotterdam has a fantastic atmosphere, excelent music. On recommendation (need to ditch that friend) trudged through building sites, gangs of kids to the Rotterdam. Very quiet as a band just getting going - seemed odd for a music weekend in Belfast. Only after drinks were ordered did bar staff ask for �£6 cover charge - no mention anywhere on pub or before - assumed it was a scam as we weren't Irish. Left drinks and left the pub - with a sour but dry taste in the mouth. Many many better bars in town - avoid this. The review by Pub Spy Reader is fairly accurate. The majority of the Sunday Night Session musicians and their followers became somewhat disgruntled by a number of recent events at the Rotterdam and decided to move to a new venue ... dirty glasses, tables not regularly wiped and toilets not regularly checked tend to be sufficient to cause regular clientele to move elsewhere. After reading a pub spy article about the Rotterdam, I thought I had to try it out. The walls were not whitewashed as mentioned in the article, the place was very dark as it was all dark red inside. The doorman wasn't the friendliest, and inside wasn't what I was expecting. I had heard before that this place was full of characters and musicians. Maybe I picked a bad night, no characters and very little drink. As for the music, there are better venues, but I did love the real fire. A brilliant bar which is now managed by Connor and Chris Roddy. Nigel Martyn looks after most of the band bookings and Ludwig O'Neill looks after the Sunday night Acoustic Sessions. If you are a budding guitar player or play the blues harp why not come along some Sunday and join in the craic. The word is spreading and a great many people are now visiting the Rotterdam Bar for the first time. By the way they sell a good variety of drinks including Whitewater Belfast Ale and Guinness ... you can even get an excellent cup of coffee. Thank god you can go tro a Bar, have a real fire, genuine people on both sides of the counter and decent live music. If youre a visitor to the city, skip the Crown and experience a real night in Belfast with local people from all parts of the city, North, South, East and West. Best pint of Guinnes in town. 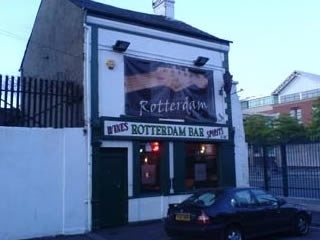 The Rotterdam Pub: £5.00 cover charge. Loud five piece band on four feet by four feet "stage". Only pints available on draught was Guinness. Bottled beer came from a cooler which wasn't working, in other words all beer was at room temperature. Sweaty white washed walls and people. Bar staff smug and unfriendly. A BIG deal trying to get home from the Rotterdam as you must rely on a trusted taxi service even though the Rotterdam have a doorman who will page a taxi for you, so long as you are not headed for one of the nearby working class areas of Tiger's Bay or the New Lodge in which case the doorman quotes the name of a cab company which services these areas and tells you to call them. Checking online I learned that the owners have invented a new history of this pub. Did you know that it was once used to transport people from Belfast to Australia? No? Me either. Bring on the wreckers ball.